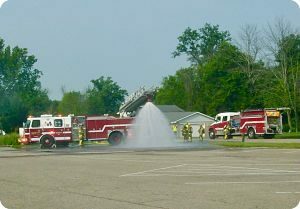 Residents near the HVL pool experienced blocked roads and the alarming presence of fire trucks, ambulances, and hazmat vehicles on the morning of Saturday, July 22. 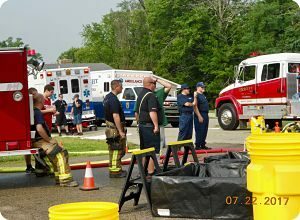 All the activity was part of a coordinated full-scale exercise (FSE) that simulated an accident involving a chlorine tanker truck. Over 70 professionals from 14 organizations in SE Indiana and the greater Cincinnati area participated in the event which was the culmination of years of planning, policy development, partner interactions, and response training. HVL Lead Deputy, Dave Wismann, has been involved throughout the planning and training activities since the onset and coordinated with our board and property manager to make the pool site available for this exercise. This type of training ensures that our security force is ready to deal with potentially deadly hazardous spills that could impact resident health and potential environmental issues.